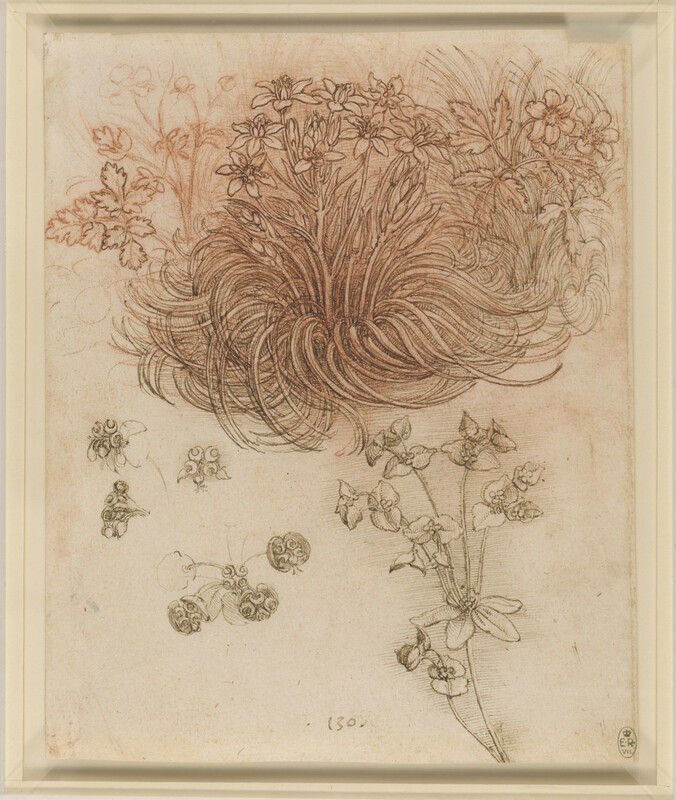 The focus of this drawing is a clump of star-of-Bethlehem (Ornithogalum umbellatum L.), whose swirling leaves are seen in the studies for the kneeling Leda and in most copies of the painting, where it softens the edge of the rock on which the swan stands (the same device is seen by the infant Baptist’s legs in the St Anne cartoon, of a similar date). Flanking the star-of-Bethlehem is wood anemone (Anemone nemorosa L.), and below is sun spurge (Euphorbia helioscopia L.) with details of its seedheads. Although the star-of-Bethlehem is somewhat stylised, the blades of grass growing untidily among and behind the anemones suggest that Leonardo observed these plants in the wild. Melzi's 130.